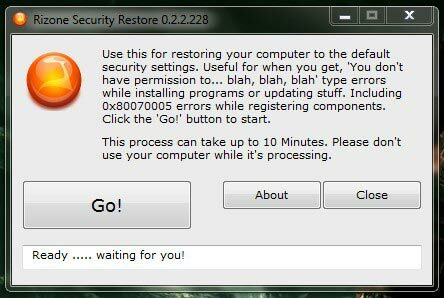 In the following simple solution, I’ll show you how to fix the Windows Update Error 0X80070005 that is ever so often encountered after a Malware attack. The automated fix was created by Rizone Technologies and has worked wonderfully on the select few troubled computers I have had the opportunity to test it on. Warning: This software is provided ‘as-is’, without any express or implied warranties whatsoever. In no event will the authors, partners or contributors be held liable for any damages, claims or other liabilities direct or indirect, arising from the use of this software. Note: If you do not have any 0X80070005 errors or Installation problems, do not run this tool, it will be unnecessary.